Below, you can find a list of R3P2's past initiatives, events and everything else we've done! From April 10th to 13th, R3P2 had the privelage of competing at the Ontario District Championships alongside some of the best teams in the world. We worked hard to qualify throughout the season and were proud to seed 16th out of the 40 teams in the Science division. We also won the championship entrepreneurship award, an amazing feat. Our team finished the competition ranking 57 in the district out of a total of 179 teams! Sadly, this was not enough to qualify for the World Championships in Detroit and as such, this brings an end to the 2019 season for R3P2. We'd like to thank all our sponsors and we hope to see everyone back for next year's season. Here we go again! 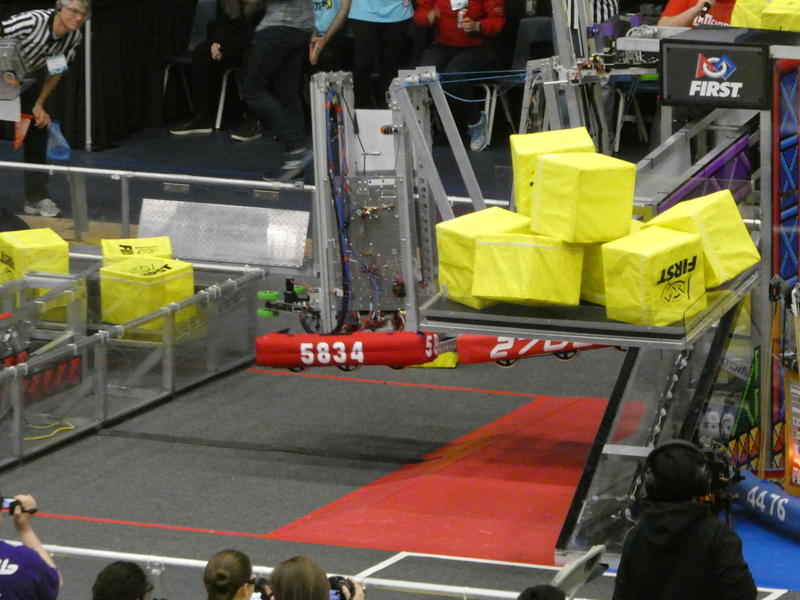 5834's first competition of the year, Fall Fiesta took place this past weekend, on October 20th, 2018. Our team had a blast training new drive team members and introducing rookies to the First Robot Competition environment. We were thrilled to be the second seed of 25 teams and to captain the second alliance with our close friends, team 4476, W.A.F.F.L.E.S. and 2nd year team, 6632. We were delighted to win the gracious proffessionalism award, ending the event in a good way. To increase awarness of FIRST and STEM at Riverdale, the Riverdale Raiders Robotics ran a new initiative: the Robotics Fair! This event allows all students to get a chance to get an inside peek into R3P2 and learn about all of our moving parts from Computer Aided Design to Sponsorship Relations. The students also get a chance to get to drive the robot and complete an obstacle course. The event was a huge success and we have already seen huge increases in interest during our recruitment. On April 12th to April 14th, our team gained enough points to attend the Ontario District Competition at the Hershey Centre in Missisauga, Ontario. After two days of competing, our team finished 23rd from the qualifying rounds. Unfortunately, we were not picked during alliance selection but are very proud of our performance during the entire competition. Sadly, our power up season ends here but the amazing experiences, lessons and support we have received from other teams and our sponsors has been worth the journey. Thank you to everyone who took it with us and hope to see you in 2019! From March 29th to the 31st, R3P2 participated in the North Bay Regional at Nipissing University. Placing 24th after Qualification Matches and a few challenges in the way, we were chosen by our alliance captain Lake Effect Robotics and W.A.F.F.L.E.S Robotics in the second alliance and worked hard together to advance to finals ! We had an amazing time working and playing with them and can say that this competition has been one of the best performances by our team yet. From March 15 to March 17, we competed at the Ryerson University District event in downtown Toronto at the Mattamy Centre. We placed 12th out of 37 teams in the qualification matches and were picked as a member on the 4th alliance. After two competitive quarter final matches, we were sadly eliminated. Early on in the PowerUp build season, we visited one of our platinum sponsors: the Optimist Club and updated them on our new season and our current initiatives. We owe a lot of our team's success and abilities to them and constantly thank them for their support. In the summer of 2017, 3 disastrous hurricanes hit southern North America, 2 of which immensely affected many islands in the Caribbean. Most of these countries almost completely destroyed and students and children were not able to attend school until much later in the year. Our fundraiser, Care for the Caribbean intends to raise money for this cause and in turn provide students with school supplies, and other technology assests to help them succeed and learn. On January the 6th, all FRC teams were introduced with a new challenge for the 2018 season: FIRST POWER UP . Since then, we have been brainstorming designs and coming up with ideas and strategies that will hopefully make our 2018 season a successful one. In mid-November, a group of female members on our team gave a presentation to a Girl Guides of Canada club about females in STEM and Robotics, hoping to give them an introduction to the opportunities that they could have in Science and Engineering in high school.